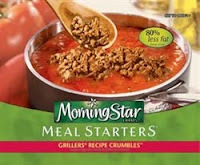 I've found that the Morning Star crumbles are saltier than Boca crumbles. Which means if your making tacos (the seasoning for which is mostly salt), the Boca crumbles are better. I like Morning Star, but for Mexican, I always use Boca.